Do you know how to specify enclosures that are compliant with fire safety regulations? Specifying the correct electrical equipment for lighting and emergency systems can help improve the fire resistance of building. Unfortunately there are currently no universal standards available to help contractors ensure they pick suitable housings. Therefore it is important to work with an enclosure supplier that can prove the fire resistance of their product. Chris Lloyd, Managing Director of Spelsberg UK, looks at current safety regulations and how to safely house critical electrical systems to protect from fire. In the event of a fire in a building, ensuring the safety and well-being of anyone inside is the top priority. Critically, fire resistance of the electrical equipment is key to guaranteeing the safe functioning of emergency electrical systems relevant for rescue and escape, such as emergency lighting and smoke extractor systems. Therefore, it is of utmost importance that the electrical installations meet fire safety regulations and guarantee safe function during a fire. In the UK, BS 7671: 2008 (Requirements for Electrical Installations, IEE Wiring Regulations 17th Edition) is the national standard for the safety of electrical installations. It specifies that the electrical equipment must not present a fire hazard to adjacent materials and that the wiring systems must be selected and erected to minimise the spread of fire. According to the BS 7671 requirements, there are two main methods that provide fire protection to electrical circuits. The first one consists in encasing the conduits in concrete, mostly within walls; while the second option is ensuring cables and enclosures can withstand fire for a prolonged amount of time. The first method presents some limitations. First, it is necessary to design the encasement before the building is erected. Second, the concrete encasement protects against flame passage, but does not protect an electrical circuit from failure. Finally, this design does not allow for access or visual inspection of conduits and cables. All these factors make it challenging to maintain fire resistance properties during and after any renovation. In fact, any modernisation or maintenance requires the demolition of the original concrete encasement. The action is therefore expensive, time consuming and there is a risk of jeopardising the fire protection of the system and the building. The adoption of electrical circuit protection systems, like Spelsberg’s WKE fire protection enclosures, provides a cost-effective and easily replaceable alternative that makes maintenance and upgrades easier. When this system is used, the outage required to complete maintenance and installation projects is shorter as it is not necessary to dismantle concrete encasement and the action does not compromise the fire safety compliance of the entire building. In addition, this method can delay failures in the electrical circuit in the occurrence of a fire. BS 7671 Amendment 3 specifies that to be specified for this role the enclosures used must be made from non-combustible materials. Otherwise, it does not define what non-combustible materials are or what material properties and performances are expected from electrical enclosures. Furthermore, in Europe there is currently no harmonised regulation on system circuit integrity in the event of fire. Therefore, different equipment protection companies adhere to different norms. The stricter and most commonly applied guidelines are the ones provided by the German standard DIN 4102-12 “Fire behaviour of building materials and elements – Fire resistance of electric cable systems required to maintain circuit integrity – Requirements and testing”. According to these, the electrical equipment must remain operational for at least 30, 60 or 90 minutes, in order to let the people inside leave the building. In this case, the minimum duration for functional integrity of electrical systems is expressed as an ‘E’ followed by the number of minutes of functional integrity. For example, E60 indicates that the enclosure can resist fire for a minimum of 60 minutes. In order to design in fire safety in a new or renovated building, it is important to be assisted by an electrical enclosure company that is fully conversant and compliant with the existing regulations. One that adopts the best fire safety standards, such as DIN 4102-12. An example of DIN 4102-12 compliant electrical circuit protection systems are Spelsberg’s distribution boards, cable junction and connection boxes. The company manufactures and tests its WKE fire protection enclosures in accordance with DIN 4102-12 and they guarantee electrical functional integrity for 30 to 90 minutes (E30 to E90) in the event of a fire. 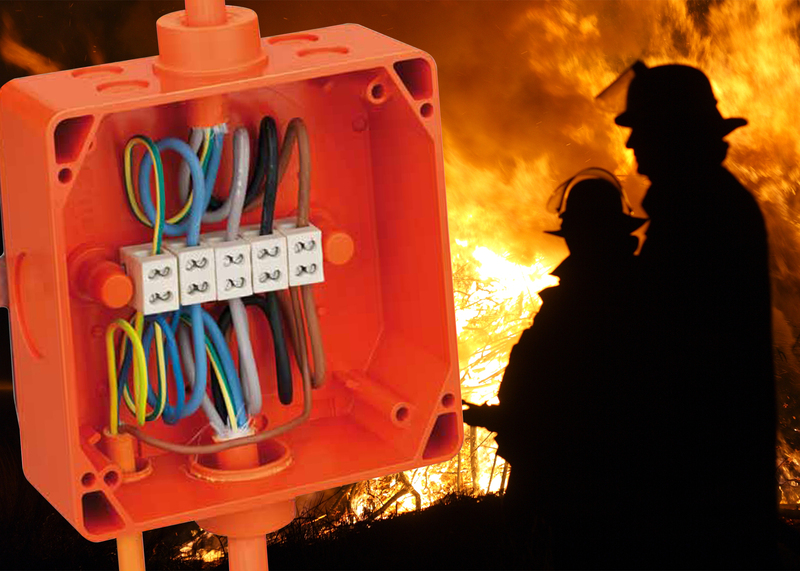 In addition, fire resistant junction boxes’ terminal blocks offer additional durability in conditions of extreme heat. To provide this additional protection, Spelsberg pre-fits its WKE range of junction and connection boxes with ceramic terminals. To conclude, it is not only important to build electrical equipment that is fire resistant at the point of installation, but to ensure that cost-effective maintenance and building updates will not affect its fire safety performance. Electrical circuits should not fail instantly, in the event of a fire, but should remain functional and integral to allow rescue and escape of people inside the building. Therefore, it is crucial to consider if the electrical circuit protection systems adhere to any regulations concerning functional integrity and how stringent they are. To get the highest fire resistance performance for electrical equipment in buildings, it is essential to discuss with electrical installation specialists what solution fits best and how to maintain it properly. Spelsberg WKE fire protection enclosures offer reliable solutions for electrical installations in fire protection walls and ceilings. The company also has an expert in-house technical team that can also assist with project planning and ensure the systems are safely fitted and mounted in a short amount of time. Photo Caption: Fire resistance of the electrical equipment is key to guaranteeing the safe functioning of emergency electrical systems relevant for rescue and escape, such as emergency lighting and smoke extractor systems.